She could have been a corporate honcho or a computer engineer. 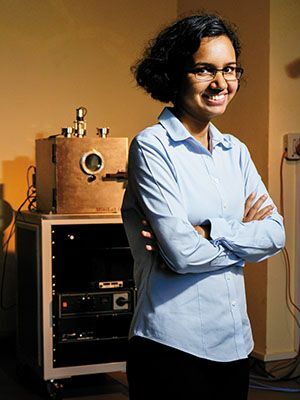 Instead, Prerna Sharma, 29, immersed herself in pure science-the study of soft condensed matter physics-and has already earned the respect of her fraternity. Nearly all Indian school children are asked at least once if they want to become doctors or engineers when they grow up. Prerna Sharma’s father asked her that question when she was in the 12th grade at Rukmini Devi Public School in Delhi. She chose to be neither. She almost joined corporate India, but was put off by the Common Admission Test’s (a requisite for business schools) need to gauge only speed and accuracy. She could also have had a successful career in computer engineering. Instead, in a move that her seniors and academic advisors say is fortuitous for the Indian community of physicists, Sharma opted for a career in pure science, more specifically the study of soft condensed matter physics—material such as creams, gels, shampoos and even cell membranes that may resemble but are not really simple fluids. The 29-year-old assistant professor at the Indian Institute of Science (IISc), Bangalore, was part of an Indian research team that published a paper in the prestigious science journal Nature Physics in 2008. At the time, she was a PhD student at the Tata Institute of Fundamental Research (TIFR), Mumbai. Last year, her more recent research, conducted when she was a post-doctoral associate at Brandeis University in the US, was published in another international peer-reviewed journal, Nature. “I was interested in knowing how fluids interacted with each other in the two-dimensional world,” says Sharma. In the 3-D world, oil and water do not mix; oil droplets merge into a single layer that remains separate from water. But in 2-D, the rules are different, and this intrigued the scientist in her.